Today’s before and after will either put a smile on your face (because the transformation is beautiful) or serve as an episode of “scared straight, this is your life.” Either way, I’m happy – HA! When this client contacted me I was knee-deep in a estate full of crafts and was oh, so tempted to tell her I was crafted out, but the more I listened to her specific needs the more I wanted to check it out. Our client is a artisan and teacher who has lost both of her legs and desperately needed a transformation of her work space that could not only be accessible, but encourage relaxation. Since I wasn’t sure I could find someone with the same bandwidth and vision as the Kuzak’s Closet team, I called Taylor and we headed to the beach (this project was in Santa Cruz). Some of my peers feel that consultations are a waste of time, but I love them. How often does a stranger invite you into their home to look at their most disorganized living spaces that they wouldn’t even reveal to their best friends? Consultations are pretty awesome. Clients who request a consultation are willing to make change and are looking for guidance, why wouldn’t I take a peek? In some extremely rare cases I can’t see the light at the end of the tunnel – but in most cases I do. For this particular project I had a vision for the final space as soon as I walked through the door. AMAZING! I know, I love-love-love it! 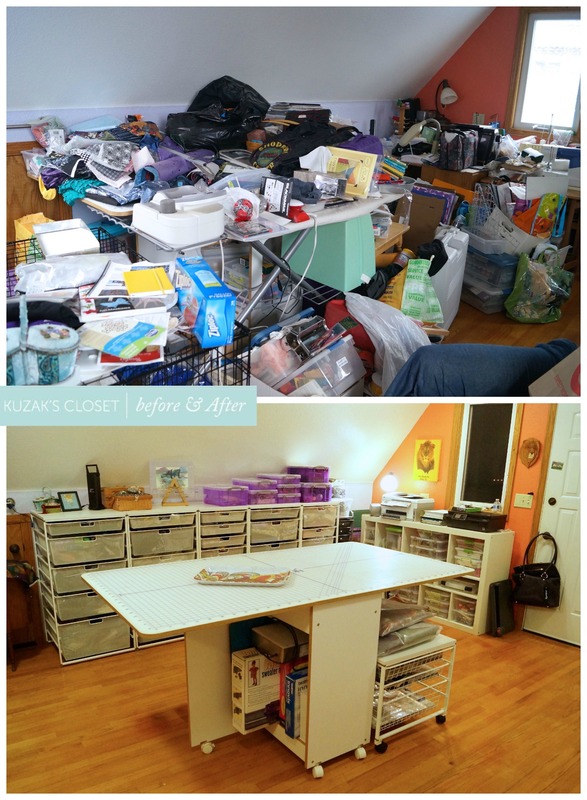 Most of all, I love that we were able to complete the transformation by just letting go of unwanted clutter and re-purposing bins and furnishings she already owned. This cutting board makes a great work space and I wanted it to be in the middle of the room so it could be functional and to avoid clutter from piling up on top of it. The shelving in the background is by Elfa from The Container Store. My client already owned it but we clustered it together to create a more uniform look. The shelf under the window is new from IKEA and it works perfectly to hold bins of different sizes and serve as a counter top for the printers and small electronics. I love dual-purpose furniture! These Elfa racks are so handy for crafts. We spent hours sorting through all of the goodies inside each one and labeling them so our client can easily find what she needs. The white mesh disguises the clutter and I love that an entire drawer can be pulled out at a time if you need to work on a specific project. For example, if our client is sewing she can pull out her supplies or equipment when she needs it instead of having all of the little bits and pieces clutter up her sewing table. You can choose any size drawer you like and we divided the items based on use and volume. The top of the Elfa shelves are solid so we used them for display and storage for bins of supplies. Our client already owned these purple bins so we re-purposed them to store small odds and ends and they add the perfect pop of color to the top of the shelving. This was after 9 hours and it only shows the one corner. I only take on one or two projects like this at a time because they involve so many little pieces. For most organizing projects my clients have to review and make decisions on 200-300 items, for this project my client probably made a decision on 3,000-5,000 items. Each little piece needed to be reviewed, sorted, and then a place designated in the newly organized space. Most people would have a melt down after 2-3 hours but our client hung with us for the entire project. I kept telling her how I was amazed at her decision stamina and I meant it, she was able to stay calm and make practical decisions the entire time. That is a sign of a motivated client! I mentioned this IKEA shelf above and here is a closer look. I love that the compartments are different sizes for different bins, it creates a neat look and functional space. Before her printers were in a corner and hard to reach, now they are the front and center making it easier to print patterns and labels for projects. We re-purposed most of the bins in this area after selecting matching pieces from what she already owned. I bought one Expedit shelf from IKEA to store lots of supplies in clear bins from Costco, visual is key! I was worried that some of the bins would look cluttered but she can see what she is looking for easily and quickly. I just love a before and after! Before and afters the best report card for the end of a project. They really give me an idea of what could be improved and the difference that efforts can make. I am really critical about results because I know clients are spending time and money on their personal space and I want them to see the value. In this case I think our client should be happy with the outcome, it looks great! Her dog is really the true judge, when she snuggled in the recliner at the end I knew our job was done! Behind the recliner is a pretty little space full of knitting supplies, I just love the color! I actually got these white bins/shelves from another organizing client. She was donating them from her garage, they were used for shoe storage and we just installed custom shelving so she no longer needed them. I asked her if I could re-purpose them in this craft area and she was happy to give them a new life. Taylor really wanted to use them for yarn and I think they work perfect for storage, it looks like a craft boutique now! Again, I just love the color! Putting this space together was really fun. I am so glad our client was able to see the “after” before we started so we could get to this point. I love this next trio of photos, a before, middle, and after. What a transformation! Before we started this project the sewing machines were buried in a corner. Our client needed them to be more accessible and functional so we created a sewing nook that will always setup and ready for creativity. She has 2 sewing machines, a felter, and a serger (3 things I wish I knew how to use) and now they are all in one place. She can pull up a chair and get to work. We created a bin called “projects I need to finish” and I expect her to be motivated to tackle them after all of her hard work in helping us get the room to this point. This little rolling cart is one of my favorite things that we added to the space. It is from IKEA and is so darn cute. My guys assembled it and they don’t love it as much as I do, I guess it’s a pain to put together but it sure is darling! We used it to house her Zentagle supplies, a meditative form of drawing. The drawers hold “just enough” and it is on wheels so she can move it to any workspace if needed. I am so glad we were able to complete this transformation! Taylor, Christopher and I went for two of the purging sessions, Taylor for one, and then I went back with Taylor, Ese, and Yovan to finish the final organization. We were able to donate the bulk of the donated items to RAFT, a local non-profit resource for teachers. The house is just a few blocks away from the beach and we all enjoyed a lunch break by the surf and the sand. Ese had never been to Santa Cruz and seeing his face light up when he saw the ocean made me so happy! I am very lucky to be at a point my career where I can choose my client and my projects and I am so lucky to have met this client and have been able to make a difference in her life and her home! A WONDERFUL TRANSFORMATION! WOW! WELL DONE GUYS!! Client and doggy must be very very happy! AMAZING!!! As always I wish I had been there to help. You, Taylor and the whole team did a great job. Awesome!! All the different types of art and craft interests she has!!! Wow! A girl after my own heart! Love the “projects I need to finish” bin! I’m totally copying that! Just make sure it doesn’t get too full! This is truly the work of a professional organizing company! 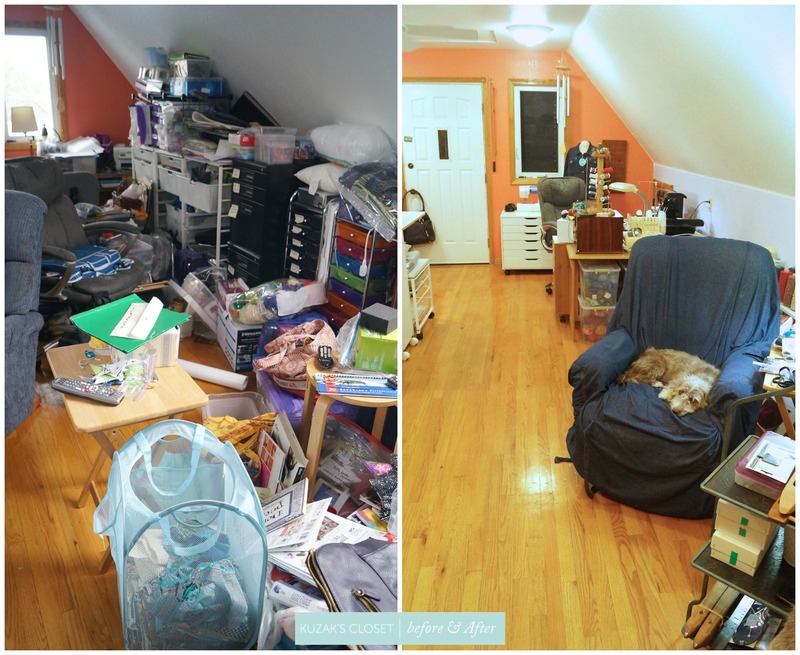 Loved seeing the before and after pics… Touche to you and your team! Excelent job! Thanks for posting all of the details and also how much time it took you for the whole task.